As of iOS 5 for iPad, the ability to tweet (post very short messages to Twitter) became integrated into several apps. 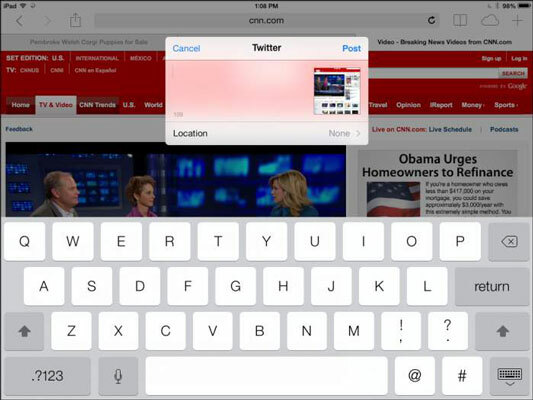 You can post tweets using the Share button within Safari, Photos, Camera, and Maps. First, go to iPad Settings and tap Twitter. Then tap the Install button and add your account information. Many readers already have a Twitter account and are hooked on tweeting. If you’ve never tweeted, you can go sign up with the service; then activate Twitter in iPad Settings and use the Twitter for iPad app to manage your Twitter account. After you have an account, you can post tweets, have people follow your tweets, and follow the tweets that other people post. Now, when you’re using Safari, Photos, Camera, or Maps, you can choose Twitter in the screen that appears when you tap the Share icon. You see a Tweet form like the one shown in this figure. Just write your message in the form and then tap Send. Note that a number in the bottom-left corner lets you know how many characters you have left to use in your tweet. Tweeting is a simple menu choice in several apps. When you’re filling in the tweet, you can tap Location and then tap Enable in the dialog that appears to turn on Location Services, which allows Twitter to ascertain your location and share it with others. Be cautious about using this feature; if many people follow you on Twitter, they can use your location to track your movements and know where you live, where you go to school, where you socialize, and so on. This information can be used to commit a variety of online and offline crimes.